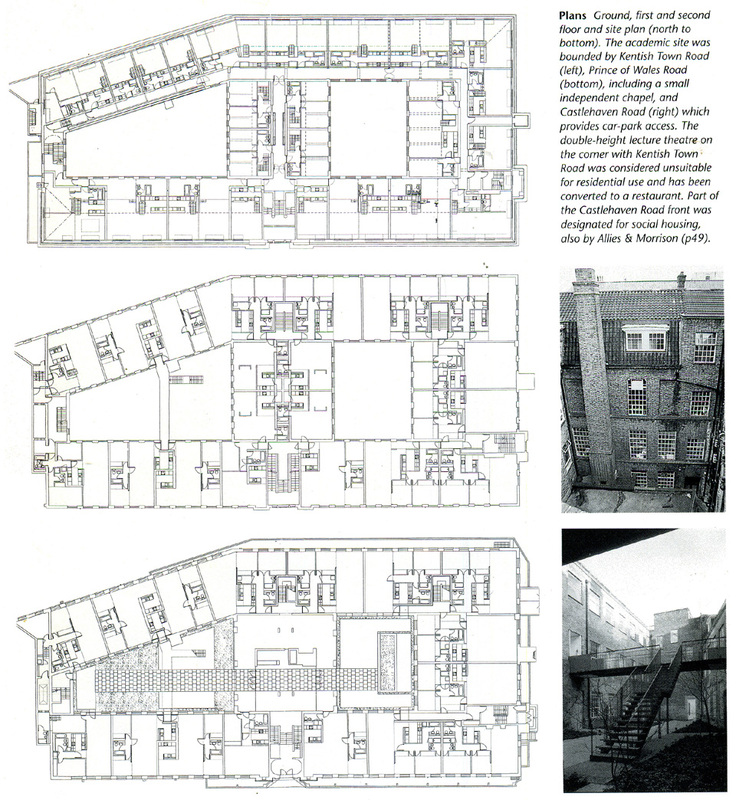 Steven Bates on the subtle transformation of a collage building into housing. The reuse of the existing construction is both an environmental imperative and an opportunity to communicate architectural ideas. Re-working the old requires such a precise measuring of adding and removing that it can be successfully carried out only within a clear strategy. While the possibilities range from preservation to renovation, transformation can be achieved through an integration of new and old in ways that allow a unique identity to emerge from the presence of both. This can require a re-presentation of the old and an articulation of the new within an abstract framework of ideas seeking to give new legibility to the whole. Allies and Morrison’s transformations for the developer Dorrington of the former North Western Polytechnic building represents a quest for this sensibility. Within sight (and near the corner) of Kentish Town Road Number 1 Prince of Wales Road stands grandly and somehow remote from the intensity of the main shopping street. The formal language of the building, with its quasi-classical repeated order of windows and cornices, together with the line of trees, creates a backdrop to the pavement which provides little distraction. Indeed the ground floor windows cills, raised slightly above head height, give the impression of distance between internal and external environments. This condition, developed initially perhaps for reasons of status (raised entrance and ground floor proportion) now contribute to a comfortable sense of living in the city (where heads f passer-by maybe seen but with no sense of overlooking). To the passer-by there is little evidence that architect have been at work and even less that the building now provides some 60 home. New work to the elevation has seemingly engaged with ideas of continuity and restoration. The most visible addition is the new glazed entrance, which is detailed in a way more familiar to that of an office, shop or hotel. 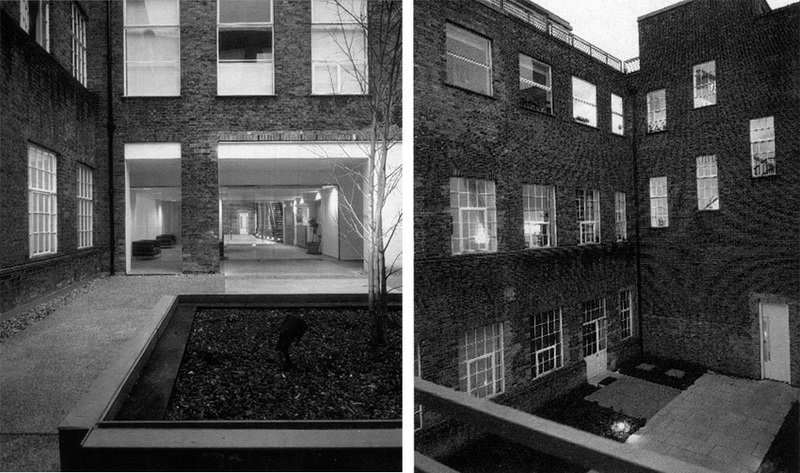 Above Right: Before and after courtyard views. The addition of a new floor deck over the basement parking in the west court has changed its proportions, removing the “light-well” character, and unifying the levels of the two courts and foyer. 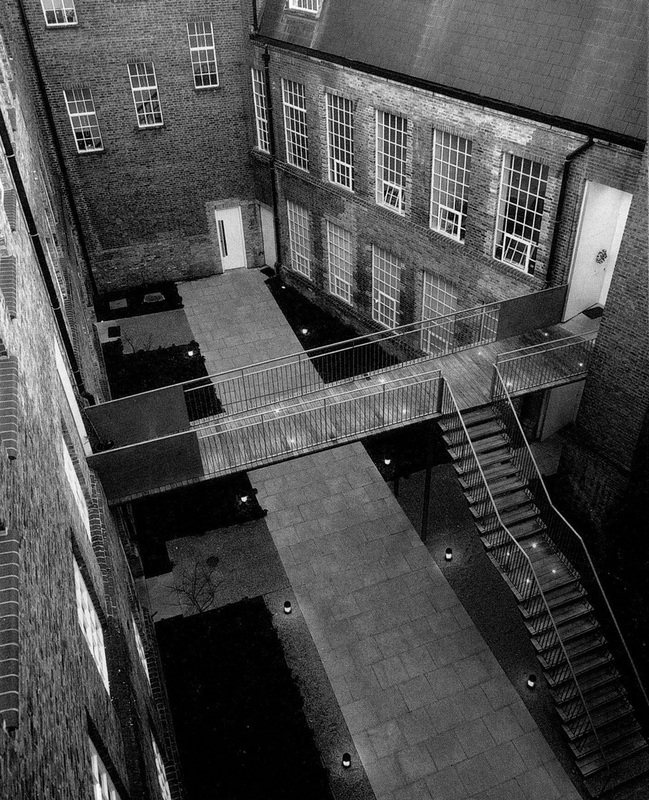 The placement of the doors at the very edge of the entrance steps encourages the visitor after ringing the doorbell, to step back and down onto the pavement. This contributes to a sense of selective access and suggests a clear separation between public and private realm. From the entrance threshold, stone paving steps up progressively across polished screed and concrete flagstones to a side lit lobby. Looking back towards the entrance, the carefully refurbished mahogany stair with its ornate balustrades rise to a half-landing at the front of the building. Its original importance as the main stair has been subordinated as it serves only a third of the apartments, yet its status through the restoration remains iconic. Floor-to-ceiling glass walls on either side of the lobby reveal two interior courts extending away from the lobby. The visual transparency and continuity of the ground material gives this space an ambiguous character, somewhere between inside and outside, and the detailing is so spare that the lobby becomes hardly and enclosure at all. Rather than expressing an architectural language throughout the jointing or proportion, the architects have allowed another identity to emerge, one that is directly present but difficult to define. The two courtyards are open to the sky and quiet. They seem straightforward and self-evident and give the impression of always having been there. This however is deceptive, as variations in the brick wall surface indicate the selective removal and adjustments made to give the impression of a simple found space. These remain the most memorable set of spaces in the project. Rich in spatial variety, they are impossible to imagine in a new building yet they have been completely reinvented. Their success lie in the way new interventions, particularly in section, have been attuned with old components in ways that become indistinguishable. Within the courtyard the street feels remote and the interior life of the apartments becomes more apparent. The sound of voices or music through the open windows and the sight of different blinds and curtains are signs of shared living which have found expression despite the strong ordering of the original structure. The smaller (western) courtyard is regular in shape and room like in proportion. New elements have been placed within which limits its use. As raised planters, positioned symmetrically in the space, tends to direct routes to the corners, towards the covered apartment vestibules, while a timber bench located in the axial position directs the view back through the lobby and into the other courtyard. 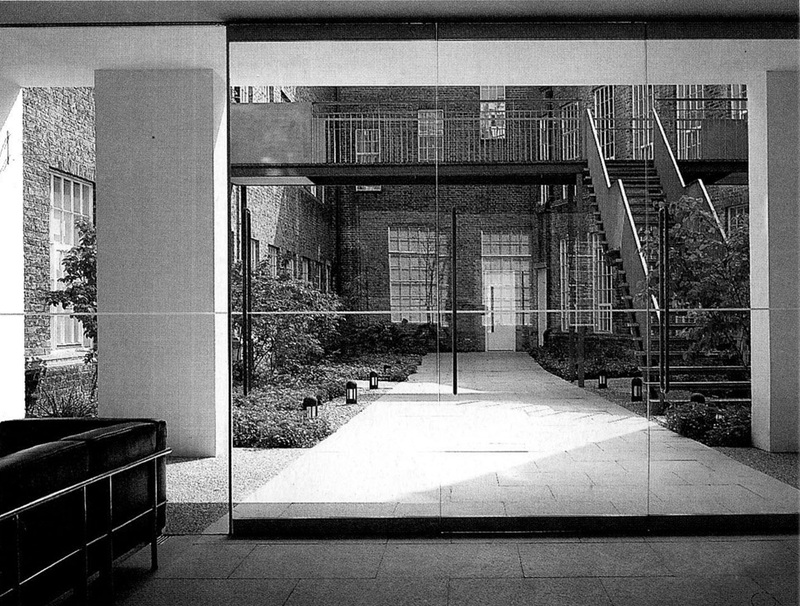 The length and tapper of this eastern courtyard, together with planted beds abutting the building, create a wide path for walking through. A new stair at the one side rises to a bridge spanning across the space which serves first floor apartments. Shaded porches to ground floor apartments lead off the two courtyards at various points, with other entrance doors located more directly from the central space, like windows in the walls. The walk from the entrance to your front door takes a few minutes and varies according to the location of the apartment. For a resident, the moment of reflection that this walk may create could become a distinct experience within a daily life of work, travel and home. Above Left: West court with planter, windows reatain the “found” character of the inherited building. 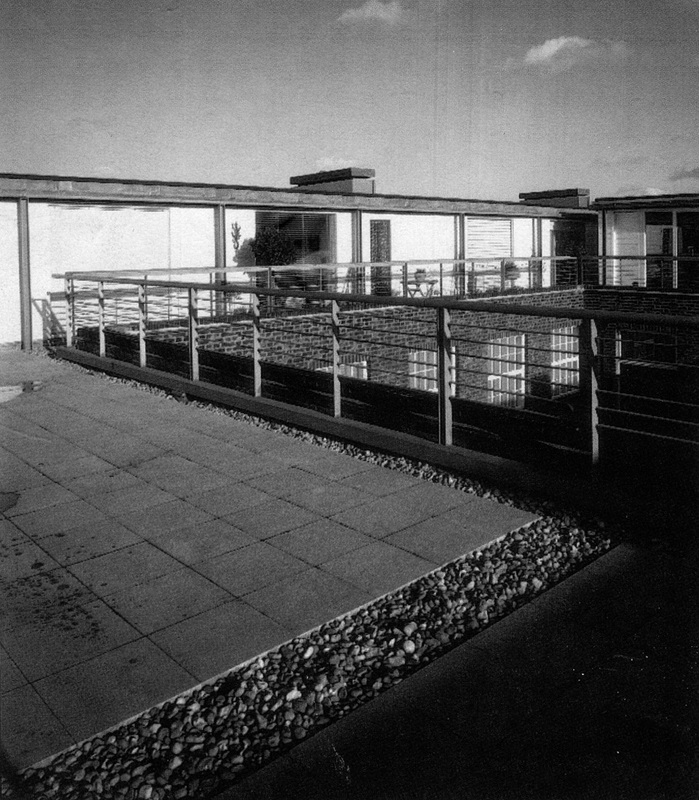 Above Right: The addition of an extended gable creates an upper floor and roof terrace for the maisonettes. While in the courtyards the combination of existing and new materials, dirty and clean stock bricks, painted render, river washed pebbles, rolled concrete, coarsely textured metal-work and silvered timber, develops as a single whole, in the apartments the articulation of the new is more apparent against the old. The inherent spaces are tall and care has been taken to introduce smaller spaces without creating a compression of volume. 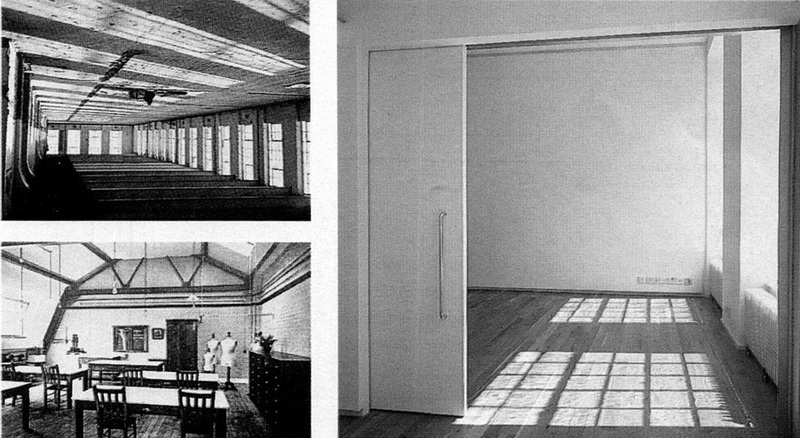 The principal room in most cases extends across the full width of the space, marking out the extent of the original structure bay. As a result the proportion of the space feels natural and generous. Alongside, a new core space contains kitchen, bathrooms and storage. 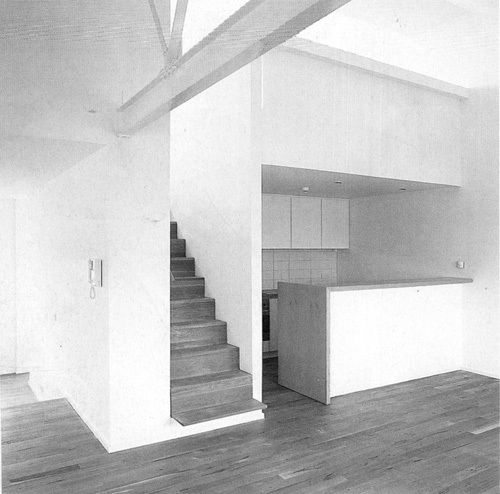 Above: Living-room and kitchen/study core in flats. Above: First floor with corridor and classroom walls removed and second floor before conversions. The core reappears in slightly different configurations throughout the scheme, at times giving the impression of being an autonomous structure, part way between furniture and pavilion. It has shelves, niches, sleeping platforms and interior volumes with passageway through it connecting various parts of the apartment. 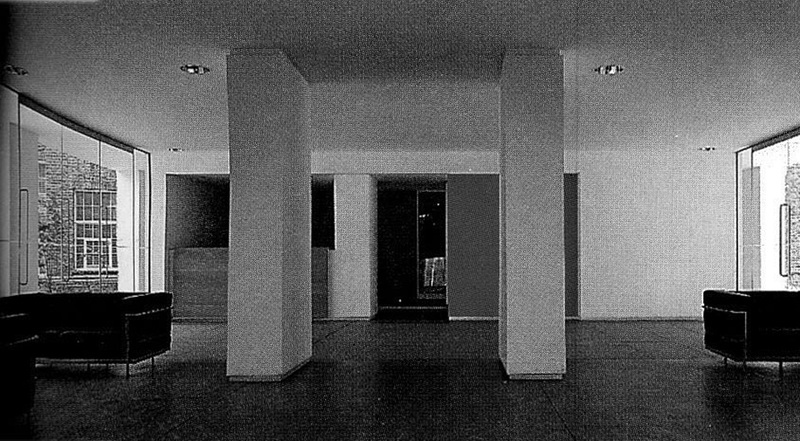 These volumes display their newness through architectural detail, shadow gaps distance them from wall and ceilings, folded surfaces of beech appear as layers added (to form the kitchen worktops, internal stairs and bathroom ducts) and recesses and slots appear in a figurative way against white planes and sliding panels. The material presence of the original volume has been played down to almost nothing. Where elements have been added, such as 50mm high skirting boards, their expression seems to be dictated by their dialogue with the new (50mm recess), rather than a proportional appropriateness or abstract ideas of layering. Likewise the choice of narrow strip timber floor, artificially shiny and uniform in appearance seems a missed opportunity to engage with the robust, material intensity of the existing building. The thought required for these background details and the decision necessary to measure the display of newness is central to the task of working with old buildings. Above: Stairs up to the study/terrace and down to the bathroom in the second floor maisonette. In the second floor maisonettes, the existing mansard roof has been cut open and raised to accommodate mezzanines which lead to a narrow roof terrace. This creates a new rooftop elevation, experienced only from the courtyard side. The pavilion like elevations, composed of fixed glass panels, opening shutters and painted timber boarding, are modest in relation to the whole; they stand apart from the rest of the building and seem to engage with the roof lights, shed and pavilions found on the top of the buildings everywhere. 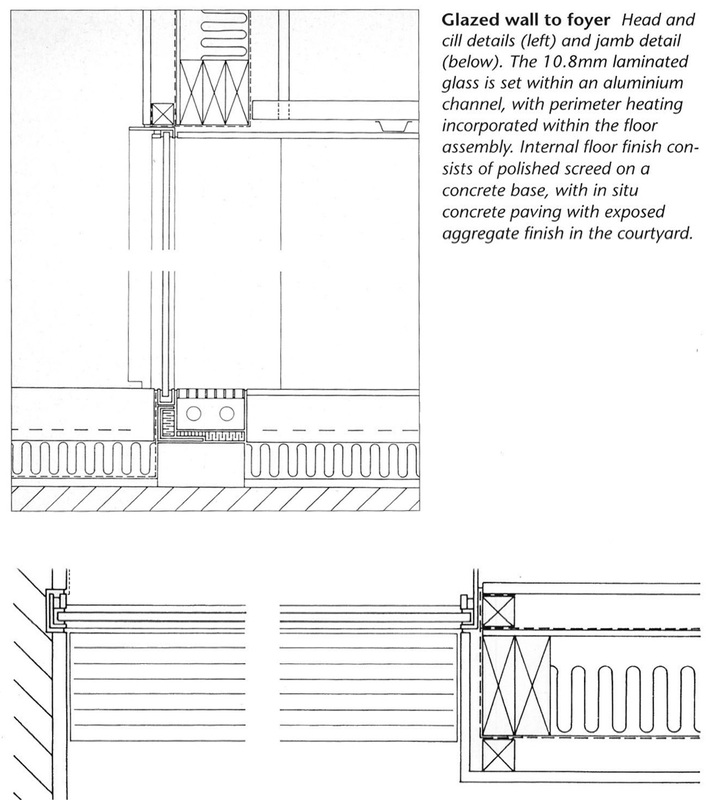 The material (timber), the proportions (square) and visible ornamentations (free standing metal frames) stem from ideas about framing and spatial layering developed by architects over a number of years. In the rooftop environment, previously unavailable, a new relationship is struck between the existing structure and its place in the city. Evidence of its success show in the way residents have appropriated the rooftop in ways which are spontaneous and wilful. Overall the project demonstrates the work of architects who think both conceptually and pragmatically. It is constructed reasonably and it has benefited from the lead given by a developer-client who feels comfortable making aesthetic judgements. It succeeds at many levels introducing a new use while at the same time amplifying the essence of the building as found. In other parts it reminds us of the need to continue questioning the role of a detail as the measure of adding. Above: Plane of timber entrance door to first floor flats (bridge access). Flats are entered from open lobbies and the flush white painted door frame details, without architrave or shadow gaps, gives the entrance door an ambiguous indoor/outdoor character.